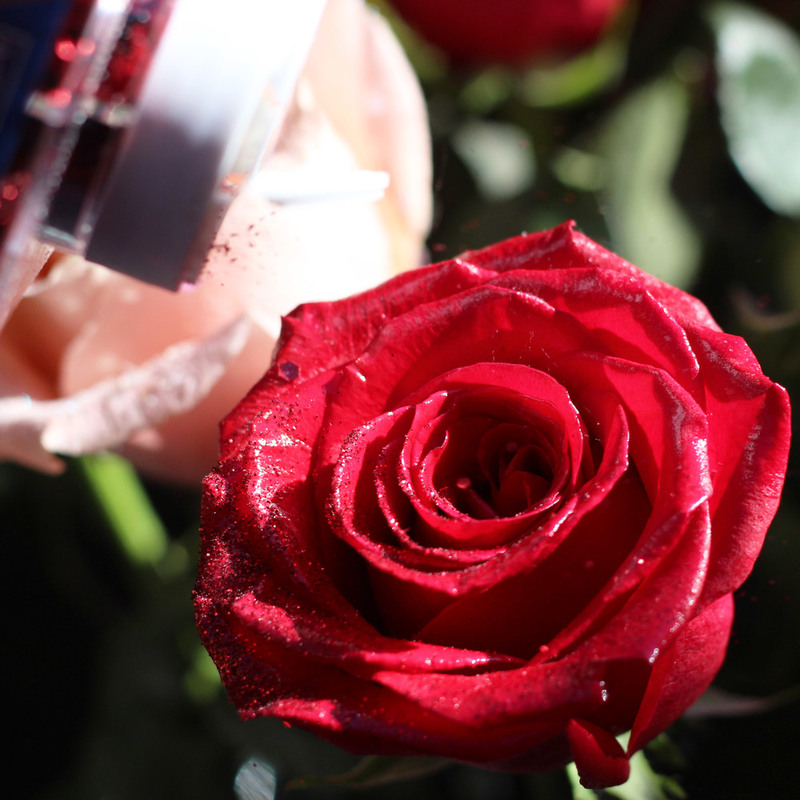 Oh my word...glitter roses! Won't these be fun for Valentine's Day? They are shimmering and gorgeous, and really easy to do. I chose this rose colored 'faux depression glass' looking vase. (It was really made as a candle holder - but I loved it and bought it anyway and it worked wonderfully.) It does have an insert at the bottom of the rounded part, so note with the measurements that the stems don't go all the way down. Depression Glass was machine pressed, tinted translucent glass that was made during the Great Depression. It is often seen in light greens, and pinks, and has a dimpled look that catches the light. This pink 'vase' has the look of Depression Glass, and it is perfect for Valentine's Day and roses. 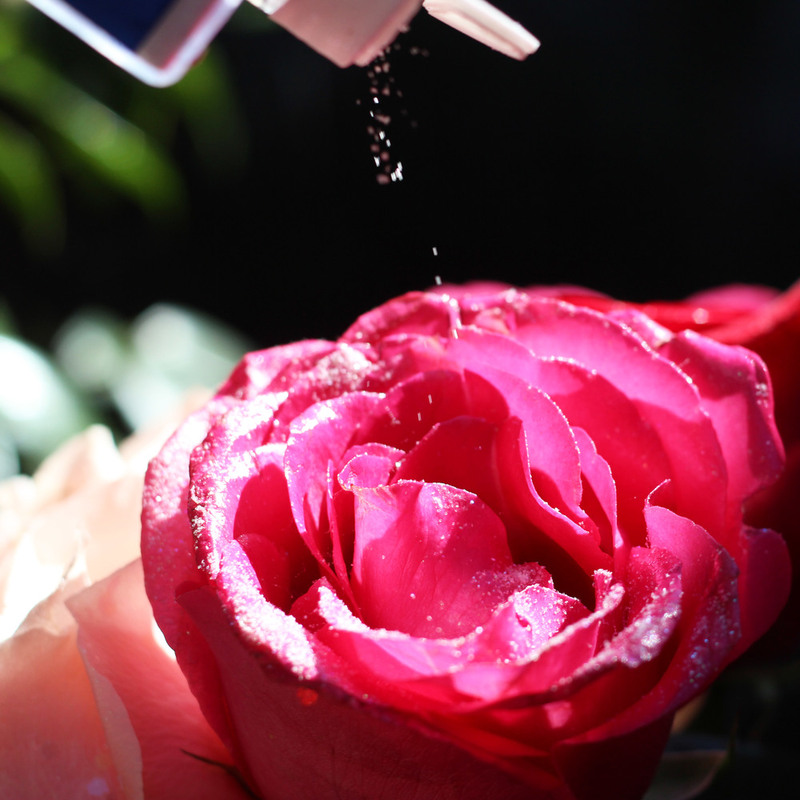 Set up outside to spray the roses and sprinkle them with glitter. Cover all furniture and the ground with plastic garbage bags to catch the over-spray. (You don't want to breath this stuff.) The garbage bags will help you gather up the unused glitter, so the entryway of your home doesn't look like the path to OZ when you are done. Well are you ready? 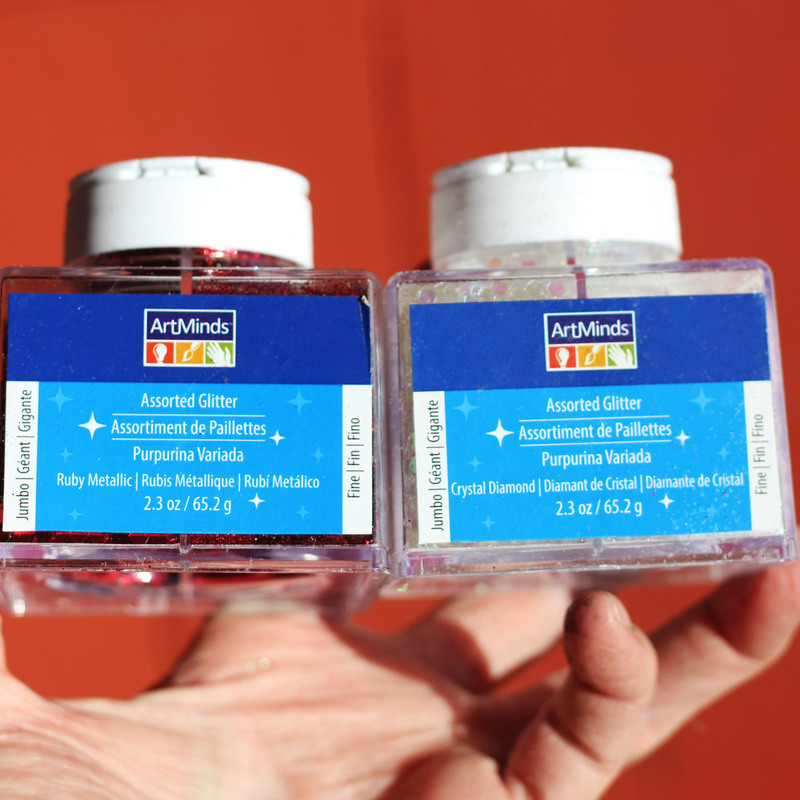 Use red and iridescent glitter. This is the fine size. This is the jumbo size. I used mostly fine with a little jumbo. This is the adhesive. 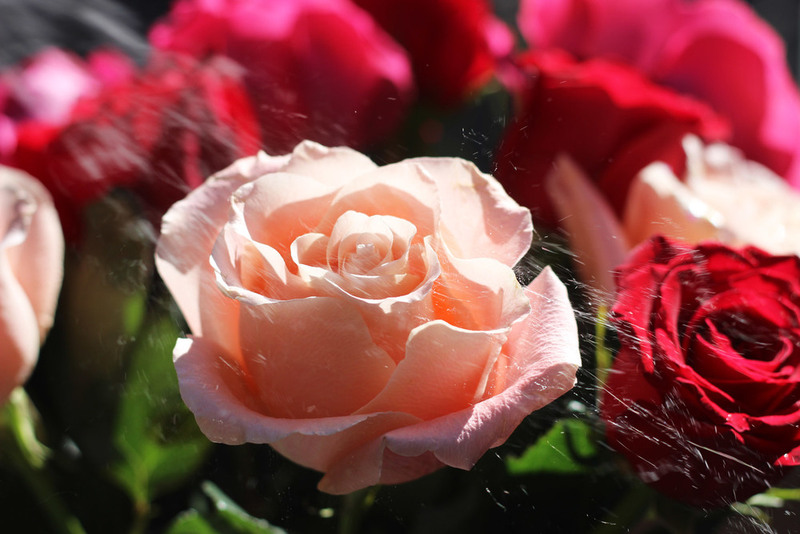 Make sure it is acid free and safe for flowers. Spray edges 1 rose. Oh... you say you've already had the winter blizzard? Sprinkle edges with small glitter. Sprinkle edge with jumbo glitter. Put glitter on half peach roses. Sprinkle red glitter on edges. Sprinkle jumbo glitter on edges. 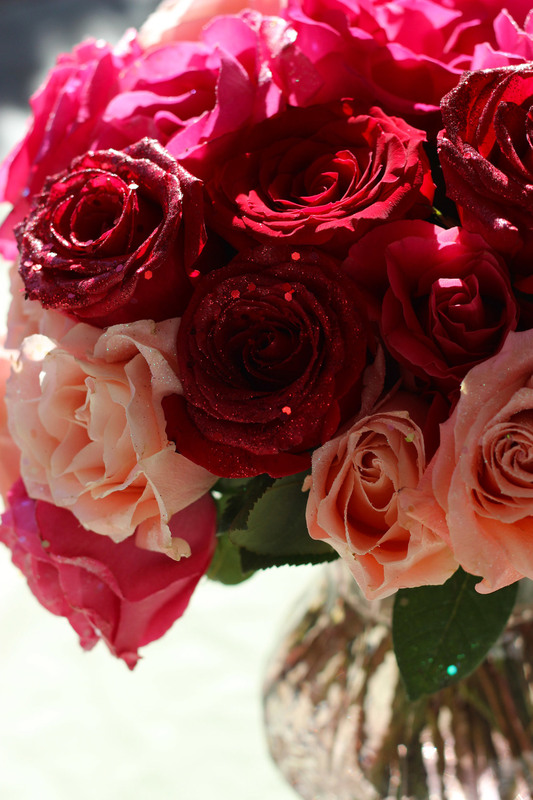 Put glitter on half red roses. Spray edges one fuchsia rose. Sprinkle small glitter on edges. Sprinkle jumbo glitter on edges. 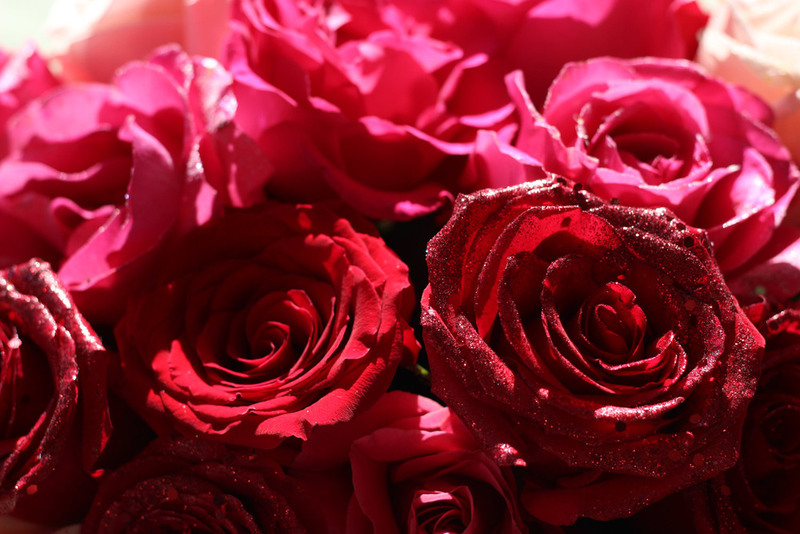 Put glitter on half fuchsia roses. Pour water up to the narrow part. Make a bouquet in your hands, with center a little taller (abt. 12.5 inches, sides 10.5 inches) Cut all stems. Half the roses will have glitter. Some's got it. Some's don't. It makes it more interesting. You can look for roses that are opened up, or keep them a day to let them open. The three colors compliment each other. It's complete. Have a smashing Happy Valentine's Day.